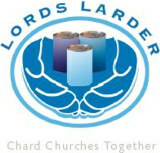 Our local foodbank, ‘Lord’s Larder’, is a joint initiative run by Chard Churches Together. Find their website by clicking here. It provides emergency food supplies for people in need. Non-perishable foods are donated by local churches, schools and businesses. Please take food items to the Forefront Community Centre or leave in the Lord’s Larder donation box at CBC on a Sunday (ask welcomers for details). Please ensure that any food donated is well within the sell-by-date. At present, due to storage limitations, Lord’s Larder is unable to stock non-food items. A list of requested foods is found here. Find information on how to apply here.